I'm in the need of buying a new router. You've maybe seen in other threads I've been looking at the Synology RT2600AC unit to handle the routing and WiFi but as chenks pointed out, They are fairly new to the market so may not be the best option. I've looked at several Netgears, Asus, TP-Link, Linksys etc but after previous experiences with a couple of the manufacturers, I don't really feel like spending the sort of money they demand for a half hearted unit. I've asked in quite a few places but pretty much every where suggests to get a Ubiquiti unit either the USG or Edgerouter X. Price wise, It appears you get a bigger bang for your buck compared to the big names. It seems a little daunting to me actually as I probably wouldn't use 80% of the features and I would say possibly at the lower end of networking knowledge really, Although I'm always willing to learn. My concern of going this route is that it may be too much for me in configuring etc but in terms of reliability, It is something I would like but simpler the better. Is one easier to configure than the other? I believe the ER-X uses a web interface for setting up rather than the cloud controller. I would probably prefer that. I've noticed some saying to avoid the USG also as it it a couple years old in the hardware department and beefier hardware in the ER-X units. Whats your thoughts on my concerns? What's your experiences with the devices? with the USB it's just a router and nothing else. the USG is part of the Unifi product line, wheras the ER-X is part of the EdgeOS line. the EdgeOS line has been around much longer. the USG is the more modern appliance as part of the Unifi line. for a home user you if you compare the USG and ER-X you're not going to see a lot of difference. the EdgeOS devices are more mature, but not necessarily more reliable or beefier than the Unifi line. i went from knowing nothing about the ER-X to having one that does my routing, firewall, VPN, VLANs, DynDNS and pretty much everything else apart from controlling the AP configuration. the Ubiquiti forums are very good no matter which product line you go down. Thanks once again checks for taking the time to explain a bit of it all to me in this thread and my previous one. Are you using one of the unifi access points too? I've been having a look through the demo GUI for both devices but not sure how recent these demos are. To be honest, the USG does look more glitzy in the demos but as you say, yes a switch and router combo would be ideal. I gather you have good knowledge of networking and manage to get around the system easily enough? Do you know of anyone that uses the ER-X and a more mainstream AP or mesh system connected to it? I use an ER-X and a unifi ap ac-lite. I know many say that if you have a USG, all the config is setup in one window. 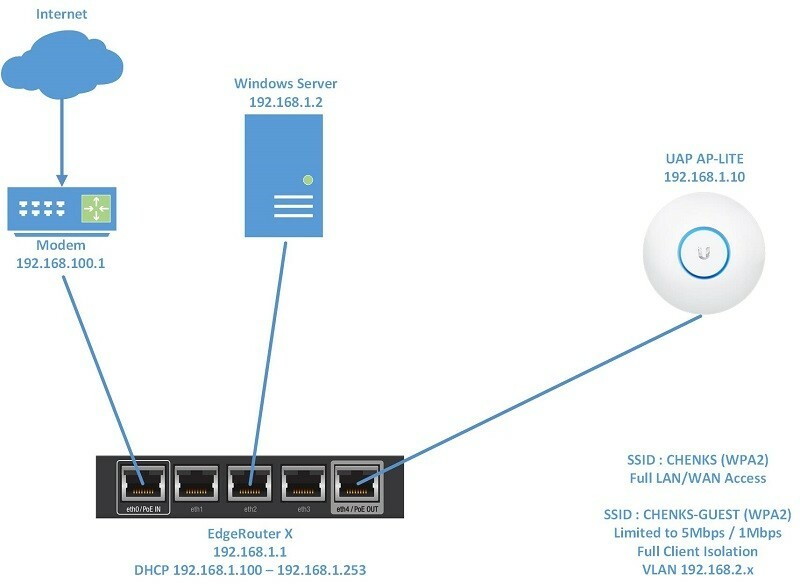 How is it done when using the edgerouter? Do you just use the unifi controller? unifi controller is just for the unifi line of products. the ER-X has it's own web UI on the device (just like you would with any other router). Sorry, perhaps I confused you. I meant do you use the controller for the AP but seeing as you say it's only for the unifi line of products I'll assume that as a yes. I use an EdgeRouter PoE and two UniFi AC AP Lite. The nice thing about the USG is that it is fully integrated with the UniFi controller so you can manage everything in a single GUI screen. But the USG GUI allows you to do less complex things than the ER GUI. However, If you've got straight-forward requirements, i'd go with the USG. Beware though, if you need/want to run Deep Packet Inspection, or traffic policies, you are likely going to want beefier hardware (if you have fast broadband). An ER-4 comes to mind (and is on my upgrade list, together with a 3rd AP). I have 150/30 internet, and even with a simple drop-tail traffic policy (which crept into my configuration during a firmware update) I wasn't achieving full line rate. I've found the ER and UniFi units to be extremely reliable once configured, only being rebooted for periodic firmware updates. Hi Simon, Thanks for your input. This is why I wondered if it was overkill for me but when you look at the price point of it compared to high end CPE stuff, I guess its better value even if you don't 80% of the features. I initially wanted to go with a USG but as chenks pointed out, The USG is router only where as the ER line includes a switch. Plus, If I were to run more than one PoE device without an injector I would need the extra ports for this. Are there any rumours of newer USG models appearing? Looking toward the future, I've read that the USG struggles with faster internet connections. Is there a lot of truth in that? the USG you are looking at is the basic USG which is just that, a router/gateway. there are higher spec USG's but those are most certainly not for home environments. in what way have you read that the USG struggles with fast internet connections? i'd be surprised there is anything your home is being provided with that it would struggle with. Unifi AP (model depending on local requirements). CloudKey (or local windows/linux system running unifi controller). and ER-X and an AP will suffice, and you just add an extra any-brand switch when required. Yup, It would have been the basic one I would have looked at. I seem to remember reading a few posts from people stating the throughput would drop right down once a couple of settings were enabled (I can't remember which ones, Possibly QoS with something else). You are quite correct that it wouldn't really effect my line just now anyway, More of a curiosity thing than anything. I'm pretty certain I will be getting an ER-X SFP with one AC-lite unit for now and see how I fair with that. the issue with QOS is that people are not understanding the method that ubiquiti use for QOS. their version of QOS siphons off a portion of your bandwidth to ensure that it never saturates out, thus it "seems" like the throughput has dropped but it's only doing that to ensure QOS works. enabling deep packet inspection will drop the throughput a little, as the work involved to do that will push the base models a but, but for a home user i'd doubt DPI will give any benefit. those are more geared towards enterprise. remeber with the ER-X you have power that using POE (via eth0) and the power the AP via POE via eth4). the ER-X doesn't come with a POE injector but the APs do. Ah ok, that's fair enough regarding the QoS. Makes sense now!! I wouldn't use dpi anyway as you stated. Reason I was looking at the SFP version was for if I wanted to power other items later without having to have a local supply. The QoS WAS brilliant when I only had 5/1 and I used it to reserve some of the up and down stream for VOIP to prevent video streaming from disrupting phone calls. Just not needed now, and wouldn't keep up at 150/30 without something like the ER-4 instead of the ER PoE. I don't actually use the PoE in my ER as I have a toughswitch 8 for that purpose, and also an edgeswitch 24-Lite. The toughswitch switch feeds my 2 AP, my 2 CCTV cameras, and a VOIP phone. (Got rid of _alot_ of PSUs). The edgeswitch feeds everything non PoE and breaks out the trunk into the various internal networks per port. I run a VLAN trunk from the ER to the edgeswitch and on to the toughswitch so only use two ports of the ER (WLAN, and trunk). I used to use a third to access the admin interface of my FTTC modem, but am now on FTTP and there is nothing to access. The USG to switch ES-8 to UniFi AP would be a good configuration. I just fire up (and update) the Unifi controller software on my MAC when I want to do firmware updates; it doesn't need to be running all the time. That's the reason I want PoE so I can do away with power supplies. I assume as chenks said, It would need to have a PoE supply rather than a wall socket to the Edgerouter to power extra items? Maybe I would be better off getting a PoE switch and just a standard ER-X model. I have a thought in my head that I would maybe like to add some CCTV cameras to look over the house as I work away from home often, Considering putting WiFi down into the garage and possibly another AP in the house depending how one covers the house. Oh me, So many choices! !